Science In Action - Webb is the only high school in the country to have an accredited museum of paleontology right on campus. The Alf Museum is a perfect example of unbounded thinking in action. It’s not just a place where students go to look at fossils. It’s a place where students are part of the scientific process, where they learn the joy of discovery, where they actually advance science. And, it’s just plain fun. Every Webb student spends a weekend on a real dig site. Beyond learning how field scientists work, students enjoy the physical challenges of “roughing it” and maybe even the thrill of making an important find for the museum’s collection. After all, 95% of the museum’s more than 150,000 specimens were discovered by Webb students, teachers and alumni. And that’s just the field work. Back at home, students take part in the entire museum process. 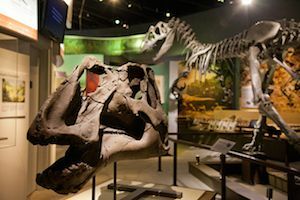 Specimens are prepared, displays are created, tours are given, excitement and discovery abound. It’s not just about paleontology – though there are plenty of opportunities to learn from experts in that field. It’s about taking on challenges. It’s about solving problems. It’s about creating something extraordinary. Imagine you’re at a dig site searching for fossils. You find one. It doesn’t seem like much at first, but when you show it to the paleontologist, he tells you it could be something important. The thrill of discovery still fresh, you carefully pack it up to take back to the lab at the museum. But it doesn’t end there. You clean off your specimen, and the research begins. What is it? How old is it? The answers unfold and you find that you have uncovered something no one has ever seen in that part of the country. But your work isn’t done. You continue your research, write a paper and submit it to a scientific journal for publication. When it appears in print, you experience the sense of accomplishment and pride of a scientist. And rightly so. No other museum in the world involves high school students in all aspects of professional paleontological research. Only Alf. Only at Webb. And whether you’re bound for a career in paleontology or another field, the experience of participating in a research project like this is invaluable. Not to mention, it looks great on a college application. This is an experience that is uniquely Webb, and way beyond the standard.